When the weather determines most happenings in a person’s life, what kind of cultural changes emerge as a direct result of their particular climate? The world of the Northmen in the Middle Ages rapidly expanded with trading, raiding, and emigration. It is generally accepted that the Viking Age started in 793 AD with the raid on Lindisfarne Monastery in England and ended in 1066 AD with both the Norman conquest of England and Norwegian King Harald Hardrada’s loss at Stamford Bridge. The scope of this work extends beyond the end of the Viking Age to 1600 AD in order to accommodate the later movements of people and sources written after but dealing with the Viking Age. The extension of the end of the Viking Age in this research also allows for a broader look into the effects of the Medieval Warming Period, one of the Little Ice Ages in the late medieval period, and changes in culture that these brought for the medieval Scandinavians. Geographically, this work encompasses a rather large area of the world. It includes not only the current boundaries of the homelands of the Northmen: Denmark, Sweden, and Norway, but extends to Iceland, Greenland, and continental Europe. The people considered in this study are the Norse, Scandinavians, Icelanders, and non-Inuit Greenlanders. Mainly considered in this writing are Scandinavians and the areas in which they lived and emigrated to in the medieval period. Medieval Scandinavians often found themselves at the mercy of nature, weather, and climate changes. The sometimes extreme weather and long winters in Northern Europe greatly impacted the cultural development of the medieval Norse, especially shaped their livelihood, entertainment, and faith. Ways in which medieval Scandinavians provided for themselves and their families greatly depended on the variable climate in northern Europe. People mainly relied on farming as the main source of sustenance, but if they experienced a poor harvest season or bad weather, many starved during the harsh and long winters. For many Norsemen, fishing was widely practiced and local marine life often supplemented dietary needs not found in grains. The climate also affected the Scandinavians seafaring and raiding. Summer storms stopped the movement of the Vikings to new lands and winter sea-ice is one of the causes of the first overwintering for raiding of the Norse on mainland Europe. Weather and seasonal cycles in the world of the Northmen determined their survivability since it effected their farming, fishing, seafaring, and raiding. With long winters and lots of time spent in close quarters it was important for medieval Northmen to develop pastimes to combat seasonal depression and fight the bitter cold. Similar to other games played by the Vikings, winter sports focused on both skill and amusement. Ice skating combined the ancient form of winter travel with competition and it became a popular sport both for those playing and others cheering on the participants. Prizes were awarded to the winner of the races to encourage competition and rivalry. For children in the winter, building snow forts became not only popular, but also taught them about warfare. After securing their forts, they would engage in snow ball fights where the brave were rewarded and the weak or shy were left behind. This helped them cultivate war tactics and team building that would be useful later in their lives. In a cold climate with long winters, it was necessary to develop different forms of entertainment like ice skating and snow ball fights to help pass the time. On this woodcut Olaus Magnus shows a Snow Castle with defenders to the left. It is attacked by other boys who tries to intrude trough tunnels and who are bombarding them with snowballs. Behind a snow-wall in the middle of the picture, some faces are seen. It is boys which brings forward “battering rams” under protection of storming screen. The ethnographical work of Olaus Magnus, archbishop of Uppsala in the sixteenth century, titled History of the Northern Peoples provides wonderful commentary dealing with winter entertainment. He describes the spectator sport of ice skating which involved men “who attach to the soles of their feet a piece of flat, polished iron, a foot long, or the flat bones of deer or oxen, the shin bones that is” and with these they race across a lake for a prize. The skill of ice skating was necessary for winter survival and travel. With many of the lakes and water frozen in the areas of the Northmen, it was popular for people to ice skate, and it became a spectator sport, a way to have fun in the cold. In 2012, Leszek Gardeła explored archeological finds to answer the question of how the Vikings passed the time in Northern Europe. He concluded that there is no doubt that there was ice skating and that the bone skates found resemble those described by Olaus Magnus. The Norse even had a god named Ullr who was associated with skiing, suggesting the prominence and use of skating in their lives. Olaus also describes the building of castles from snow and snowball fights encouraged competition among children and celebrated the players who showed bravery. He includes the various rules and prizes awarded in these snow fort games. By employing faith in their surroundings, the Norse attempted to conceptualize the weather and climate around them. It is notable that certain pagan gods were associated with climate and seafaring, especially Njord. This indicates that the ocean played a large role in their lives. In the sagas, men often call out to him and Odin during travel and environmental hardship in hopes to appeal to them to provide more favorable weather. People payed attention to patterns in the sky and some seasoned farmers practiced telling what kind of weather might come from their observations. People looked to the gods for both good weather and a way to explain what was happening around them. By placing faith in the power of Njord and Odin and paying attention to occurrences around them, the Northmen felt as if they had a bit more control over nature instead of having their lives simply at the will of weather. Snorri Sturluson’s Prose Edda work details faith and ideology around Njord and Odin. Folks attempted to appease Njord for safe passage over the sea and bountiful fishing. They did not have the broad understanding of scientific knowledge to explain what was happening around them so they attributed storms on the sea to Njord to help comprehend natural happenings. The work of Snorri is instrumental to modern understanding of how the Northmen perceived and explained happenings in life and death. Seafaring was used for trading, raiding, travel, exploration, expansion, and was an integral part of Norse society. It is possible that having a god to pray to in hopes of safe passage made them feel that they had some control over the weather. The witch to the right develops a terrible storm by emptying her pot with magic potion into the sea. A ship is wrecked in the storm. A man is holding her magic pole with a horse head on top. The moon is darkened by her magic force. John Lindow, scholar on Norse mythology, explains that since Njord is in charge of the wind and calmness of the sea, he should be looked to when a person is seafaring or fishing. Odin, the main Old Norse god, was seen as in control of the weather and movements of the sky. Snorri also attests to Odin’s power overlapping a bit of Njord’s in the area of the ocean but also weather in general that would greatly affect their food sources and travel. 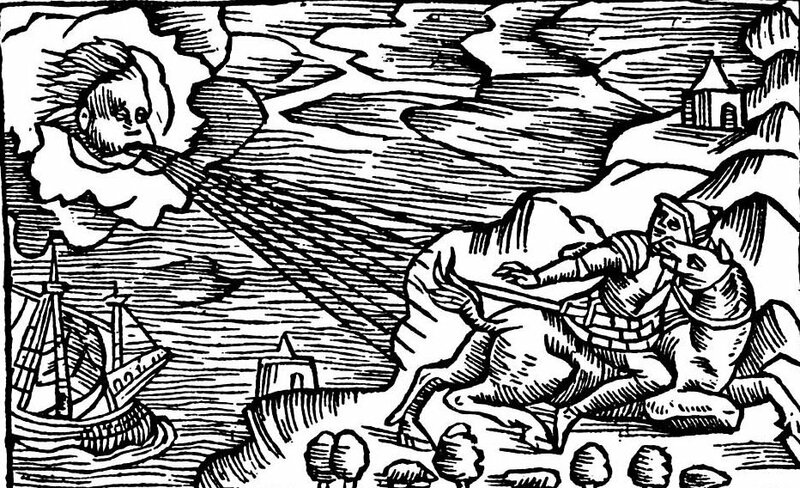 Olaus reports vivid explanations of how people tried to predict the weather in the sixteenth century by noting sky patterns. Between Gods and observations, the importance of weather in the lives of the Vikings is evident in how they perceived the world around them. The variable element of weather in the world of the Northmen helped create a culture and society particular to Scandinavia. With so much of their lives dependent on their climate and weather, it was important to adapt to their surroundings. If their grass and hay could not dry for the winter because of a wet season or bad harvest, they were able to use fish to supplement necessary nutrition. Seafaring was also left to the mercy of the weather. Many ships were lost in storms and travel in the winter was impossible because of the sea ice surrounding the northern lands. This led to the first Viking overwintering on the European continent. The medieval Scandinavians also created ways to cope with the harsh winter that resulted in competitive games like ice skating and snow ball fights for the children. These forms of entertainment encouraged competition and taught children war skills that they would need as they got older. The Norse also prayed and sacrificed to the god Njord for safe seafaring and to Odin for general weather. Through this and from paying close attention to sky patterns, people felt as if they had a bit more control over the variable weather. With all of this in consideration, the vast impacts of weather and climate on the Norse become more visible. Gardeła, Leszek. “What the Vikings Did for Fun? Sports and Pastimes in Medieval Northern Europe.” World Archaeology 44, no. 2 (2012): 234-47. Magnus, Olaus. Description of The Northern Peoples, Rome 1555. Edited by Peter Foote. Translated by Peter Fisher and Humphery Higgens. Vol. I, London: The Hakluyt Society, 1996. Sturluson, Snorri. The Prose Edda: Norse Mythology. Translated with an introduction and notes by Jesse L. Byock. London: Penguin Books, 2005. Danielle Turner is a historian who focuses on Viking culture, warfare, and movements. She is currently finishing her M.A. in history from California State University, Fullerton. Turner is internationally published and served as a special features presenter and historical consultant for VIKINGS on the History Channel. Follow her on Instagram at Viking Danielle.